Many great and successful people in this world always makes sure that they set goals in their life. 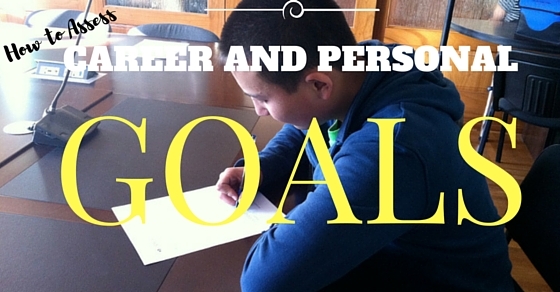 While maintaining a goal and plan for a career they know what to do next. By keeping goals in life about the career and other personal stuff, one thinks to achieve it in a period. There is a proof that those goals do get achieved by a person just because that individual thought of making a plan for his life. A man with no goals and target is like a lost sheep from the herd. Every one in this world wants a securing position in life so that he can live life without any tension or poverty. Many researches has been taken place by the researchers about this topic. They have come to a conclusion that people with no goals have often settled unstable job or a meager job. But the individuals who kept goals in life have come up with great success story that how a perfect planning of assessing their career goals and personal goals have helped them to come up to such a level. There are many theories that have come on how to make a successful game plan to achieve accomplishment in life. Below are some points which will give a explanatory about how to plan a future plan, and how to manage the present situation and how to learn things from the past that will help in future. When the individual wants to achieve a specific goal in his life then he should start asking questions and then think how to make sure that the goals are realistic. Asking a question actually is a first step for planning and assessing career and personal goals. Half of the work gets done when person thinks of planning and executing work with perseverance and determination. Therefore when starting with anything new, it is better to cross check with oneself that, Is this plan set? What is the period required to execute such a plan? And where do you see yourself in 5 years plan? It is an awesome way to kick start a career. While making such goals one has to make sure that these goals should be there for a long time. Keeping a 6 months plan will not bear so much fruit where a 5 years plan can do. Therefore the individual before finalising about the goals he has made for a career should first cross check that the goals are for a long time. Everyone wants to take shortcut but very few take a long cut which helps them in reaching their destination with guarantee. So one should be responsible and sensible to take decision where they won’t take a decision where it is going to be less realistic goals. While taking a decision for a career is actually tough to think about, one has to be clear about the objective that has to be handled and executed. Therefore that individual should do a strict research about the goals that will be needed to assess the goals and objectives that has to be carried out. That person should think what type of career he wants or where he wants to establish his career in and etc. One has to be very clearer that he has the passion to make that as a career or else everything will go waste. When an individual keeps a higher goal from himself then even a higher amount of college fees or course fees mounts up on that person. Therefore it is necessary that the individual thinks of ways to acquire funds for his studies so that he can successfully be done with the all the formal formalities of the credentials to be obtained and then be ready to taste the business market or any market the person is in interestedly. When a person wishes to asses their on going career, they should do a process of self assessment. This process towards knowing what are the essential values and standards that an individual possesses within which helps in determining the attitude of the individual and in what manner do they act in the work environment. All these values should be grouped in such a way so that the assessment process would be carried out in a much easier way which helps them in making appropriate work related decisions whenever required. This should be considered while the person is doing a self assessment of their career as it becomes easier along with understanding their concept of the job they are currently doing in a much better way as the job appeals and excited the person. These kinds of interests can come in many ways such as knowing the hobbies of the person, in what kind of environment they love working, which people they prefer working with, topics which may interest them etc. helping in carrying out the self assessment of the person. Every individual has a different and vivid personality in comparison to the other person at many levels. All the traits and qualities a person has differs from the other individuals as they are unique in nature. When a person knows themselves completely it helps them in defining themselves to the others in a better way as an individual and also with the career they are currently practising, and in what way they can help with the on going project which makes it easier to carry out a self assessment of their career and the goals they need to achieve in their lives for the future. The skills that an individual develops on an everyday basis may be similar or unique in nature with respect to the job they are currently carrying out. The skills that a person has may include the different abilities they may possess, the talents they have developed over the years, the strengths they have within them etc. So for every individual before doing a self assessment of their career, it is necessary for them to identify what unique skills they do possess and then distinguish it by knowing which skills they would like to use in their career and which they do not want to use and put those skills into practise. It is considered as a way to boost a person’s career in the eyes of others when an individual defines to others what they have accomplished over the years that have gone by when they explain it to an employer. For the person who does not have any problem or any obstruction to come their way, they should write all these accomplishments so that they do not miss out on even a single one. By this the person will realize how this particular task done by them over the years has come to being such a great success at present and helps in assessing their career in a better way considering that others also know about their career now. The best way to get to assess the person’s career in a much better way is when the person keeps conversing and interacting with their friends, family members along with current colleagues as they get a brighter and a much better way about the possible career opportunities that are available in the market at the moment and what fits the individual in the best way. With knowing this, the person develops a quality of being proactive within themselves which will help them assess their career better and achieve their goals much faster in their career. Whenever an individual is practicing a career everyday they want to achieve success in it as fast as possible. But for the person to continue the progress on an everyday basis they should ensure that they remain healthy and active everyday so that they can carry out their work. They need to exercise on an everyday basis and eat the right food so that they get enough energy to carry out the tasks everyday. This helps in continuing their progress which in turn gives a better career assessment of the individual so that they can know where they are progressing and where they are lacking in reaching their goals. While assessing the career practised by a person they also assess the topic of how well their relationships are maintained in the workplace. The person starts thinking about what kind of relationship they have with their partner and their fellow co worker, how much does the person appreciate the company they are working with along with the relationship with the outsiders. With this, they start to realize how they can improve maintaining the relationships of the work place. When the person is performing their career they do an assessment of it whenever they need to. So, on an everyday basis the person should put their best efforts and give their best contribution towards completing the task handed to them and reaching their goal in an early manner. When the person gives their best contribution to the task they will be remembered well by all their colleagues in the workplace which can help them in assessing their on going career and what goals they have set for themselves. Once the evaluation process regarding the career being practised by the individual and learning all the goals which have been set up by them is completed, then the person needs to start realizing what more they want to achieve in the career and what they think they want their next milestone to be. The next milestone what the person needs to achieve in their life helps in determining their career in a much better way as the person knows how well they want to progress in their life. When a particular task needs to be carried out by an individual in the company it is necessary that the individual works together as a group with the other employees and workers of the company to solve and complete the task much faster and also minimize any problems caused and to be solved as quickly as it can be done. When a person acquires the mentality of working together as a team they realize that they have acquired a new skill within them which will help them assess their career in a better way and help reach their goals faster in comparison to others. After the entire assessment process is done with respect towards knowing the career they are currently practising and knowing their job roles no matter what the results are according to the person, they should realize what is really preferred by them. Do they prefer practising a different career instead of the current one or are they happy enough with carrying out the same career at present. This is the most important step which needs to be handled by every individual when their assessment is done because this decides as to how they are going to plan their future and in what way things are going to benefit them depending on the career paths they choose. So once the career of a particular person is assessed by them they need to start making definite decision which they know they will benefit from at the present and for the future. It is important for the individual to start getting towards their goals so that they know they are heading in the right direction and will achieve the success they wish in their life and stay happy with the career they are currently practising. So assessing the career is a great way for the individual to actually know what they want in life and to what level they are capable of reaching.